CHENNAI, India - Aug. 26, 2018 - PRLog -- MyBeeClub, the fastest growing business unit of USA-based Arise 'n' Shine Educational Enterprise now has a total network of 25 centers across Chennai. Working with K-12 schools, preschools, educators and PTAs, MyBeeClub has an unrivaled presence and strategizes to spread its wings across the country. Within months to joining MyBeeClub, 6 year old Hiba, who was once a gadget freak transformed into a book worm. She couldn't peel her eyes from the smartphone. Video games have invaded her life and weren't leaving. With a little encouragement, this programme redirected her interest towards reading and also assisted her to improve her writing skills. An 8 year old who had never encountered English earlier now mentors his 13 year old cousin on communication and developing self-esteem. "My teachers taught me how to be bold and happy. Before joining the programme I was shy and nervous. Now I can have a conversation with anyone in English", shared an elated Krishna who found assistance here. "Happy teachers make happy students. If a teacher practices emotional intelligence, transforming their students to become emotionally intelligent is easy", says Raj Ganesh, CEO of Arise 'n' Shine. We train the teachers in developing their EQ. They have to be certified and experience the transformation before they teach the children, adds Raj Ganesh. MyBeeClub offers franchise and master franchise opportunities to integrate this programme at schools, preschools and for select individuals who aspire to become an Edupreneur. 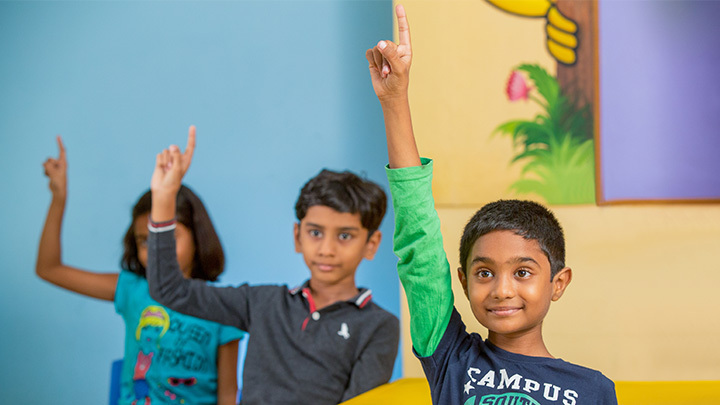 Arise 'n' Shine has transformed over 50,000 children with their reputed foundational programmes – MyBeeClub and School of English. While seamlessly integrating their curriculum to maximise students' learning potential, they firmly believe in building excellence through emotional intelligence.